to put our feet in the Pacific! We are on the toughest part of our journey. It is the halfway point. Can we handle it to continue? 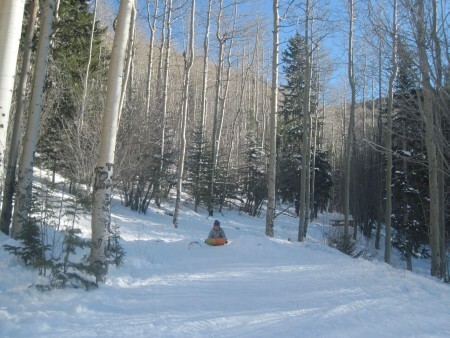 How will we fare in the mountains of New Mexico? What is winter going to do this year? Will we put our feet in the Pacific in the new year? Make it happen with us. Keep following the journey. Keep supporting us with your donations and cheers! We're getting ready for New Mexico, our toughest state. We will travel Highway 60 all the way across, into Arizona and eventually to Phoenix, AZ. We need your help. If you live near any of the following towns, or know of someone that does, contact us or track us down. We're looking for places to spend the night, whether inside a home or a spot to put our tent. We're looking for places to get a hot cup of chocolate milk. From Slaton, TX to Lubbock, Littlefield, Muleshoe, TX. In New Mexico: Texico, Clovis, Melrose, Tolar, Taiban, Fort Sumner, Yeso, Vaughn, Carnero, Encino, Willard, Mountainair, Abo, Scholle, Jct 60/47, Bernardo (I-25), San Acacia, Polvadera, Lemitar, Escondida, Socorro, Magdalena, Datil, Pie Town, Omega, Quemado, Red Hill. In Arizona: Springerville, Vernon, Jct 60/61, Show Low, Jct 60/260, Carrizo, Globe, Claypool, Miami, Superior, Florence Junction, Apache Junction. The frequency of us having internet reception will be limited. It can take us a while to get back with you. We will send a short message to our Facebook every day to let you know where we are. This message is also displayed on our homepage. 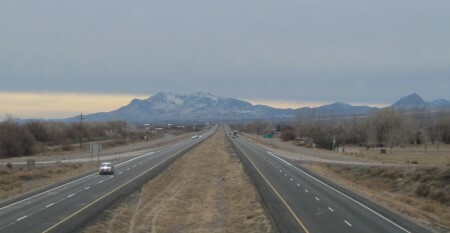 Highway 60 across new Mexico. 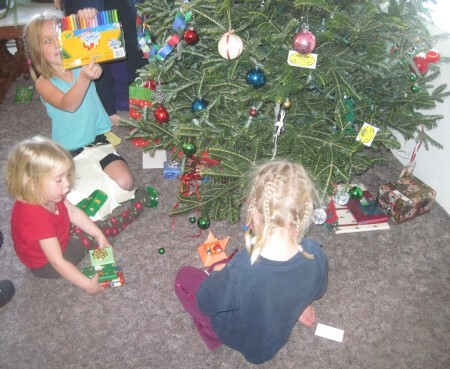 It is December 5, 2009. We are getting ready to leave the comfort and great company we've been surrounded with here in Slaton. We're dressed for cold weather and are ready to hit the road once more. Weather: We are in winter now. There is no rush to get going. We're in winter now. It is changing our daily routine. No more getting up at the crack of dawn. Sleeping in is the new method. Waiting for the temperature to rise. If it feels right, we ride. Sleeping in, a relaxed breakfast with our friends, another cup of coffee. Triple checking the bedroom for things left behind. Plenty of time for the girls to play another computer game. They've become quite provisient in it. Even Jasmine can handle the control well. We've had a week full of upgrades. Today we're going to put them to the test. Bivouak hats for Jasmine, Robin and Amarins. At 11 o'clock we are ready to go. It is time to say goodbye to our friends in Slaton. Thanks for putting us up this week. Thank you for your company. We've had a great time. We find our way out of town easily. Cross the square, pass the water towers, follow the train tracks. A train is heading our way. Waving results in a loud whistle sound many times. Close your ears girls! And we are back on highway 84. Destination for today is Lubbock. This road will get us there. The shoulder is wide and a bit rough, but nothing we haven't seen before. We're taking it slow. Looking in awe at the vastness of this land. Cotton fields stretch in every direction. The land looks very flat, but has a slight incline to it. We are taking small breaks, but don't stay off the bicycle a lot. It is the time of the year to take your breaks inside. There is none of that on the road to Lubbock. The girls feel warm in their new outfits. That is good to know. The kids in battle gear. We pedal and pedal and see the city appear on the horizon. It is actually the water towers we see first. They are the easiest to spot land marks. With the country side being so flat we can see a long distance. These water towers are still five miles away. It is after one when we arrive in the outskirts of town. A filling station slash truck stop is our first official stop. Everybody off! The Tech Cafe provides a good spot to have a rest, as well as a snack to eat and some hot chocolate. We've recently changed our fictitious bumper sticker from "We stop for slushies" to "We stop for Hot Chocolate". Warm plus chocolate plus sweet. What more can we want. Thanks for providing us with lunch Tech Cafe in Lubbock! Christy of Lubbock Channel 11 has invited us to stay at their house tonight. We had to think about it, since Lubbock is only 15 miles. What weighs in most now is a warm place to spend the night, regardless of how many miles we put in. We choose warmth over mileage. 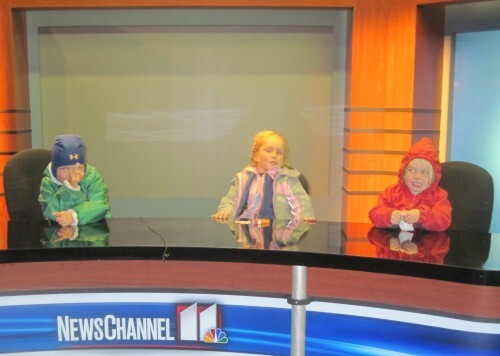 We agree to meet at the tv station. We can park our bicycle there. It's a couple more miles from the Tech Cafe. Easy to find and still early in the afternoon. 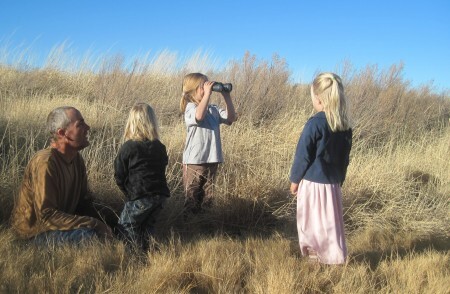 While we wait for christy to arrive, the girls go on the hunt for prairie dogs. Cute little critters that live in burrows. Next to the tv station there are many. Lots of fun to chase them. 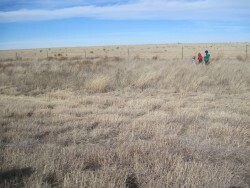 The hunt results in zero caught prairie dogs. A good thing too. Where would we have put them? We left 20 pounds behind in Slaton, we don't need any extra weight. As we are at the station, the girls and Amarins get a tour of the facility. It is amazing to see how it works. There is the newsroom with big screens and camera's. A control room where the editor decides on which camera to use and how to put the broadcast together. Then there is another area where decisions of what to put on tv are made on a continuous basis. There is a lot more to it then we thought. And now Live on Channel 11... The Pedouin Girls! When we finish our tour it is time to load up and head for the Morelands home. To Jasmine's delight there is a teaset for her to play with. The morning starts with another tea party for Jasmine. She's so tickled with it. It will be hard for us to tell her she has to leave it here. We just dropped 20 pounds in Slaton. 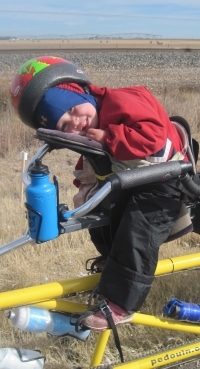 The less weight we need to carry across the Rockies, the better. We have enjoyed our stay at the Morelands. When we get ready to go, it is time to make a decision. Will we bring the tea party and also Cheyenne's coloring book? ... Yes we will. They'll have so much fun with it. Saying goodbye to the Morelands. We load everything back up at the tv station and head into Lubbock. It's quite a big city. Not to busy today, it being a Sunday morning. It takes us about an hour before we are outside of the city limits. We go a couple more miles before we find a filling station to have a break. We're thinking about going to Shallowater and perhaps even Anton. 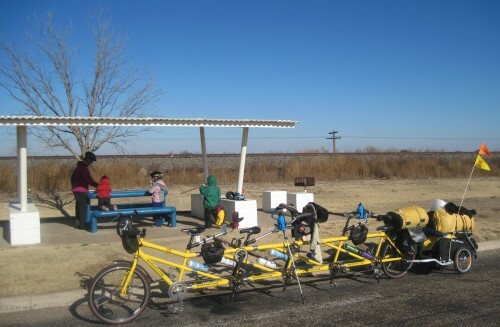 After our break at the filling station we are soon in Shallowater. Before we know it this town is behind us too. We pedal and we pedal. We see a pecan grove on our left. We follow the train tracks on our right. We can see the water tower of Anton when a lady stops and asks us where we are going. 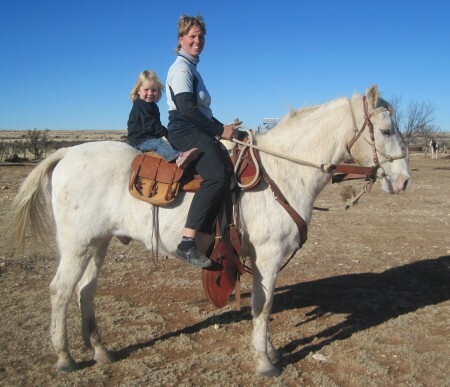 When we tell her we're heading for New Mexico, she doesn't hesitate and offers us her bunkhouse in Littlefield. This is the next town after Anton. We accept immediately. 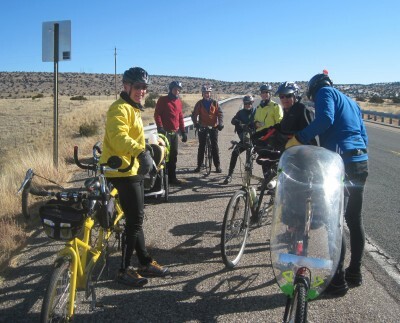 The lady, Kyla, is going ahead of us to find out if there is a place in Anton for us to have another break before we go the final miles to Littlefield. Bill especially is in need of some protein. A Quick Mart is a great place to stop. We're a bit pinched for time, it is getting closer to four then we want it to. Although short, the stay at the store is refreshing. We get back on the bike to make it the next miles. The sun is inching closer to the horizon. The water tower of Littlefield is not getting any closer it seems. It is a bigger distance then we had counted on. Then out of the distance we see a familiar car. Kyla is back to guide us into town and to be our follow car. How great it is that she came back to find us. The sun is getting so close to the horizon. Too close to the horizon. We have a hard and also not so hard decision to make. With Kyla being here it gives us the opportunity to load up the girls, Amarins and our stuff and trailer in the car. We just don't want to ride in the dark. As soon as the sun is on the horizon it's getting dark quickly. 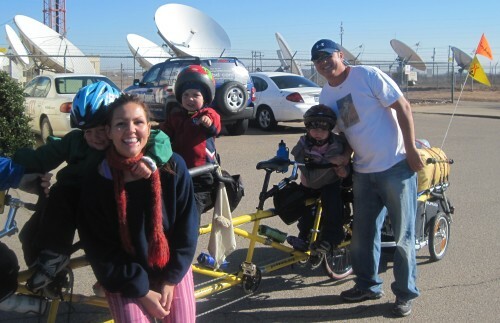 Bill is pedaling the bicycle the final mile. We were so close, but just a bit to far. Thank you Kyla for your thoughtful ness. Thanks for the gift you have given us today. Oh boy it is way to cold to be on the bicycle. Would it be okay for us to stay today? Yes it would! the girls are totally thrilled. Another play day! Robin is building a ranch. 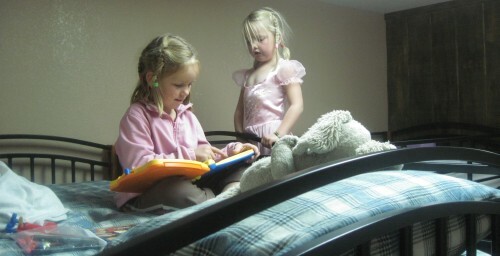 Jasmine and Cheyenne enjoy the top bunks. 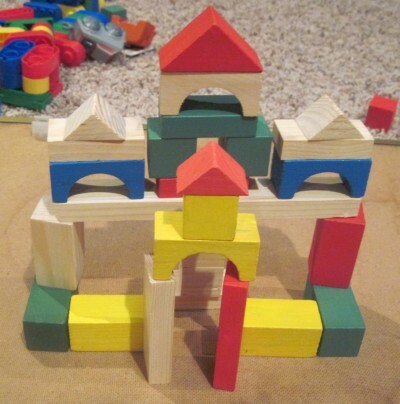 Cheyenne's castle. Picture by Cheyenne. Weather: Warming up, with gusts of wind. It's cold, it's sunny, but it is oh so windy. Another day we have to stay put. 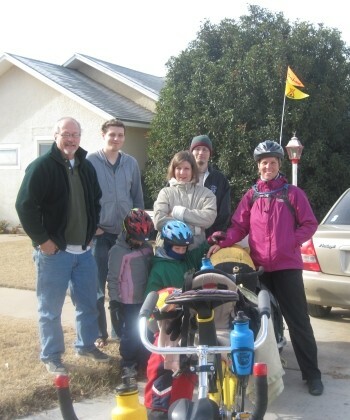 We are so thankful that Kyla found us and took the nudge to invite us into their home. Today we are invited to the open house at the bank where Kyla works. We time it right in time for the wind to pick up speed tremendously. The clouds didn't just roll in. They litterally blew in in minutes. After work Kyla takes us out to a dairy in Amherst. The owners are from Fryslan, where Amarins is from. They build this huge dairy over the 25 years they've been in Texas. What an impressive operation. After a tour we have a chance to visit with Kees and Piertsje. 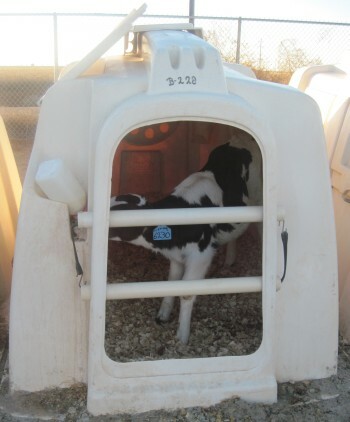 The calf lurkes down the contents of the bottle within 3 minutes. For tonight Jackie and Kyla take us out to Pizza Hut. Tomorrow we'll be moving on again. It works out well to go out for supper. The electric is turned off at their home due to a couple of broken electric poles in town. The wind was very strong today. Weather: A crisp winter day. Oh boy is it cold this morning. It would have been a very chilly night if the electricity hadn't come on. It should warm up enough during the morning so we can ride in the afternoon. We start packing up. Tidy the bunkhouse as good as we can. Make sure we have everything out of it. Then head for the main house. Yes it's a house, but naming it a home is better. It's warm, welcoming and comforting. We're so blessed to be here. We have breakfast, we have lunch. We play, watch tv and watch the thermometer. It's after one when we finally decide it is time to head out. Thank you Kyla and Jackie for letting us stay so comfortable in your bunkhouse! We're back on the loop around Littlefield. There is no wind to speak of. What a difference with the stormy weather yesterday. Although cold it is good to be back on the road again. We're itching to get to New Mexico. From there we'll see what we need to be doing. If the weather is going to cooperate with our plan, or whether we have to change our plan to cooperate with the weather. Yesterday we had a nice visit at the 5 Star Dairy in Amherst. Today we hope we can stop by for a cup of coffee. It's a nice halfway point between Littlefield and Sudan. We're steadily getting closer and see the dairy on the horizon after almost an hour. Life on the dairy is a busy life. With us starting so late today it just doesn't work out for us to stop by. To bad. Maybe better luck next time. Jasmine covers her ears. Just in case the train whistle blows. When we get to Sudan we don't know yet where we'll spend the night. It's a small town. It doesn't have a motel. We'd rather not put up the tent. We stop at a filling station to ask for the location of a restaurant that Bill was told about. When we get closer to the restaurant we can see it is closed. Time to head into town. With the help of a citizen we find a little grocery store. It has a table in it, on which we immediately lay our claim. We buy some groceries, order a fresh pizza. While Amarins and the girls stay inside, Bill follows up on a hunch. There is a church right beside the store. A place to stay perhaps? What a hunch! The minister is in the church and opens the doors wide open. Of course we can spend the night without any hesitation. This church represents a cross section of Sudans population. Warm and welcoming. With the service tonight we get the chance to meet several of the Sudan residents. Our attendance does not go unnoticed. We've been seen on the road, on tv and in the newspaper. To be here in person is a pleasure for them as well as for us. Mrs Kerr is intrigued by our individuality. Look who's talking! Mrs Kerr learned to fly a plane when she was in her 40s! Weather: Beautiful and sparkling blue. We're getting good at sleeping in. It's after eight again. We start breakfast with cereal. Later on we'll go to Terry's home and have eggs, bacon, milk, coffee and orange juice. With that under our belt and a nice increase in temperature, we are ready to start packing. We dress as if we're heading for the arctic. Which we actually are, but we won't get there until next year. 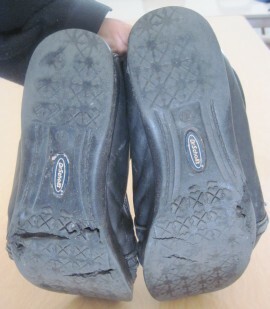 These shoes have pedalled over 3,000 miles. And they're done! They will definitely not make it to the arctic. It's close to 12 when we leave town. 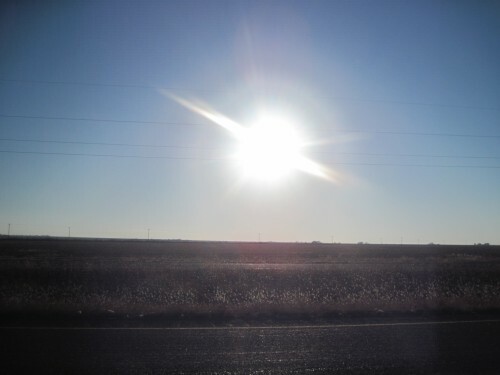 We have a good memory of our stay in sudan, TX. North-west we go, continuing on highway 84. Eventually this road will take us into New Mexico. We're getting excited about New Mexico. Several places to stay have opened up. We've got Clovis, Melrose, Fort Sumner and Mountainair covered. If you know of a place to stay in any of the other places mentioned above, Contact Us. "I'm on top of the world!" Just one of the many funny things we see on our journey. Eventhough the elevation difference dhows something different, the road certainly does go up much more today then it did yesterday. The hills are more rolling. It is not a slightly inclining plateau any more. We look off in the distance, but do not see a sign of the majestic Rocky Mountain Range yet. There is no other town before we get to Muleshoe. No filling station or little store. We have a nice pedal rhythm going. Stopping from time to time for a lemon drop or a chocolate kiss. We're riding in silence but for a song from Jasmine. Many miles are covered this way. Yeah! We finally made it to Muleshoe. Our last big town in Texas. 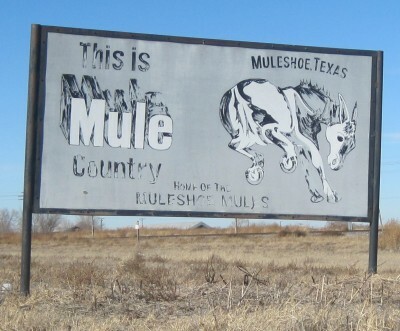 We stop in Muleshoe. The Muleshoe Rotary club has arranged a motel room for us for the night. We have to wait a while before we can get into the room. That's no problem with a McDonalds with indoor playground nearby. Hours of fun. 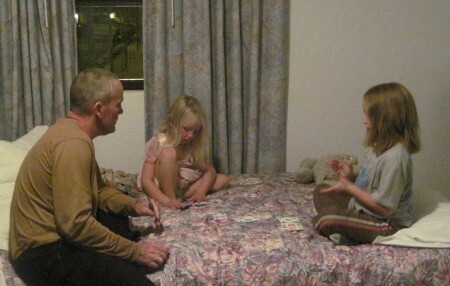 The motel provides a good place to rest, watch some tv and play some cards. Jasmine takes the opportunity to play with her tea set once more. We just couldn't leave it behind in Lubbock. She's having hours of joy with it. Playing skip bo together is a great way to learn about numbers. Jasmine wins twice, Bill once. Cheyenne is very disappointed that she loses. But she keeps on playing. Weather: Blue haze and very windy. A marvelously lazy morning. Plenty of time to play. Outside is a playground. Perfect for the kids. They can barely wait to get dressed. We wait till the sun is high enough and its rays hit the grass below the swing. And out they go! 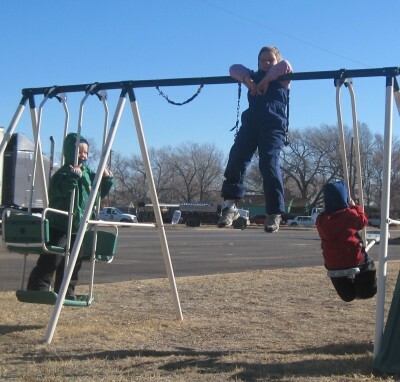 The girls are enjoying the playground as we wait for Channel 6 from Muleshoe to arrive. We are waiting for Channel 6 from Muleshoe to do an interview with us. It is a local channel. It reports anything that happens in this area. Right now we are part of what is happening in this area. It is almost noon when we are on the road. An exciting day. 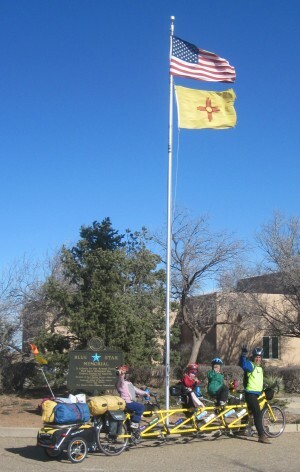 Today is the day we are leaving Texas and entering New Mexico. There are no towns of significance from here to the border. 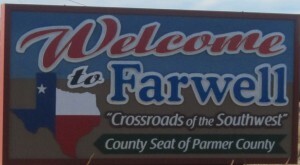 Farwell will be the first town. 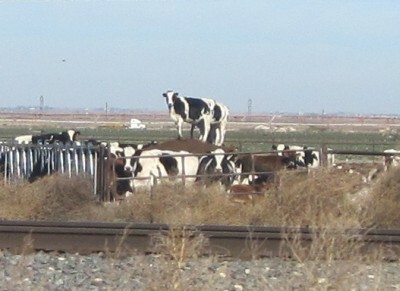 Taking a break on the railroad tracks. 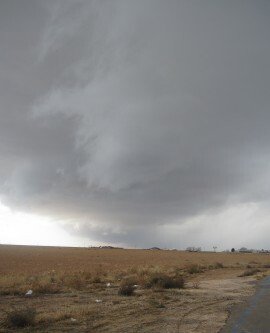 The wind is very tough, as it has been in the Texas panhandle. We huff and puff ourselves up the road into the wind. We're climbing a couple hunderd feet today. That's a couple of ten story buildings on top of each other. But as long as we keep going we inch closer and closedr to New Mexico. Farewell Farwell Texas. The last town in Texas before we enter into New Mexico. Just before we enter Farwell we meet a fellow from South Africa, he recommends A Me D's as a good place to have an early supper. It is just over the railroad tracks to the right. 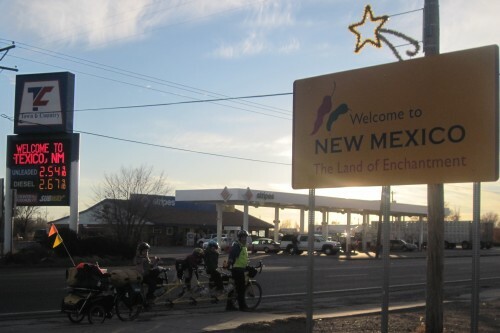 As we cross the railroad tracks, we can see the New Mexico Welcome sign. Are we in New Mexico? Before we pass the sign we veer off to the right. The restaurant is right there. Ahhh, a good place to stop. As we sit there we find out we are officially in New Mexico! Yeah! 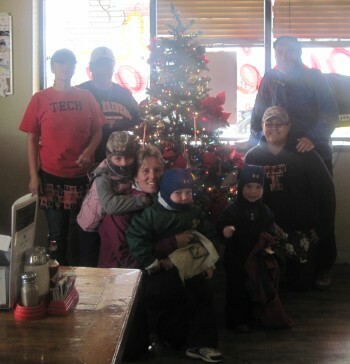 Thank you for our supper A Me D's in Texico, New Mexico! We are pretty huffed and puffed out. Now that we know that we are in New Mexico it feels good to call it a day. We have a place to stay just outside of Texico. We're not willing to go the extra miles and ask our hostess to pick us up. We can park our bicycle at the fire station. Yeah! We made it to New Mexico. After 132 days we are officialy in the West. Chauntal arrives as soon as we've parked the bicycle. We load up and head for the house. It's beautifully located in the middle of fields. What's even better is that there are boys to play with. And lots and lots of toys. Tired from playing, bellies full with supper; Josh, Zach, Nick, Cheyenne and Robin are enjoying some tv time. We feel very much at home with the Andrews family. Thanks! 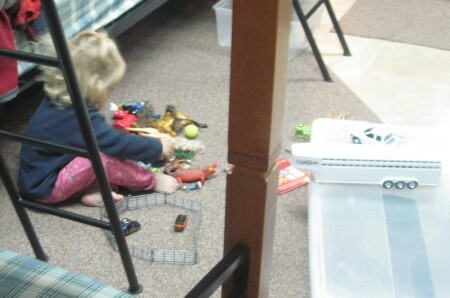 When the girls get up they immediately wander into the play room. We lie a little longer. Letting the reality of being in New Mexico set in. It's the smell of breakfast that breaks up the mesmerization. We've got some time to play and relax. And have some extra grown up time too. Then it's time to load up again and head for the firestation. 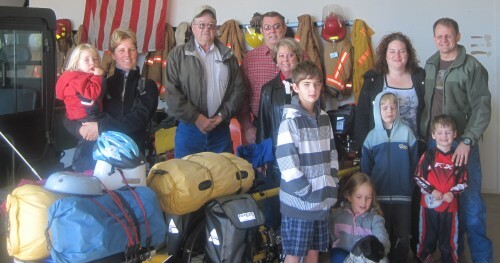 Our hosts on the right, with Fire Chief Lewis and Hal and Gloria from Texico. They're all here to help us on the road again. Clovis is straight ahead. We can see the grain silos and water towers. With the mile markers on our side, the wind in our faces, we count down the miles. 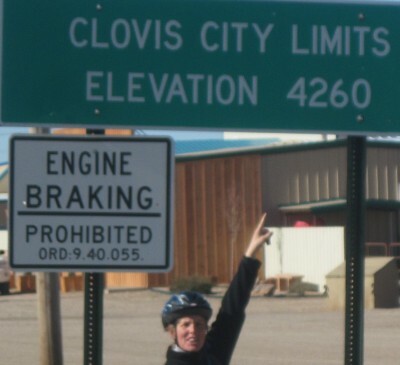 Then we finally, as it seems, arrive into the city limits of Clovis. 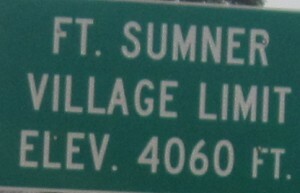 The sign has the towns elevation on it. Great. 4,260 feet in elevation and counting. We stop at the McDonalds to get out of the wind. Here we meet Scott and his wife. Scott is a fellow cyclist, although he is more into centenials. Just think about that. That's quite a feat to us. Tomorrow he's going to ride with us for a while. Just to see the beast in action. We're warmed up with friendship and food. Now we need to ride the remaining miles into town to the home of our hosts for tonight. We met Amy yesterday at A Me D's. She invited us to her home with the use of a hot tub! Oh yeah! Scott knows the way, so we follow him. At Amy and Travis' home we take over the dining room. It keeps amazing us the amount of clothing and such we have. And that we actually can carry it all with us too. The girls settle in with the available toys. Cheyenne enjoys the Lincoln blocks tremendously. 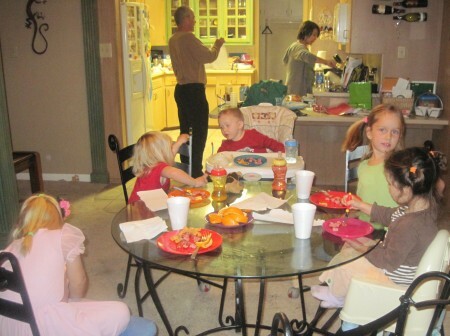 Jasmine and Robin find new friends in Isaiah and Madelin and her mom Kim. We are very thankful for another home to stay in. Calling in the troops has already resulted in places to stay all the way to Yeso, with a maybe in Vaughn. Our plan is to stay inside wherever possible. It feels good to have the first part of New Mexico covered already. Supper with Isaiah and Madelin. Tonight we spend in the company of Kim. Amy and Travis have a dinner engagement and will join us later. When the kids are in bed, it is time to enjoy the hot tub. And that feels tremendously good. We have a good night and don't wake up until the sun provides enough light to brighten up the room. We have a surprise for breakfast; an egg sausage casserole. It is delicious! At 8.30 we are ready to ride. Scott is here too. He's going to ride with us towards Cannon Airforce Base. Scott has a bike clock and can tell us exactly how fast we're going. It gives us the opportunity to figure out what our rough speed is in our lowest gears. Scott guides us out of town. The buildings cover us from the wind. When we are out of town there is still some wind cover from the trees. Anything helps. We're heading for Melrose today. It's going to be quite a climb. Scott from Clovis is riding with us today. It is nice to have a rider with us again. Bill and Scott talk bike talk. Or actually, bike frustrations. The gears that keep being messed up especially. 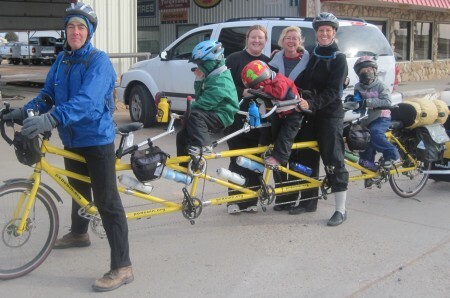 Scott and his wife ride tandem and they know all about it. Just before the airforce base it is time for Scott to head back. We ride on past the base exit to the little grocery store. The last one before Melrose. It provides a nice break. We fill up the front of the trailer with several cake like goodies. We are into high altitudes now. This close to winter it can't be but cool. We are happy with the girl's ski pants and face masks. They keep them nice and warm. Helping us pedal also works well. Robin only pedals when she's excited. She can keep quite a rhythm. 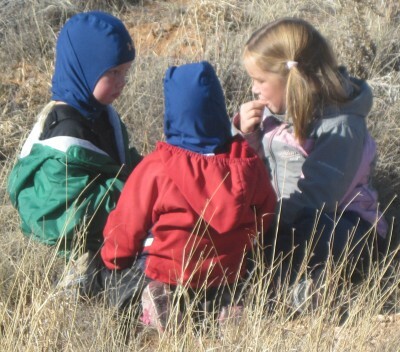 The kids in four corners. A picnic break in the tall grass. It's windy and we are going up hill. Yet we have a ground covering stroke going. Starting out with Scott, having several breaks, looking at the trains go by. Before we know it, although we certainly feel it, we are in Melrose. 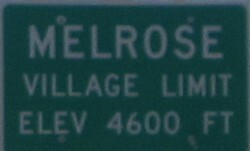 Melrose is the highest town in our journey sofar. There is a filling station, restaurant, car shop combination. We go inside to wait for our new host family to come and pick us up. Ron and Judy arrive as soon as we're inside. Ron arranges for our bicycle to stay at the car shop. Next we hop in the car and head for their home. The Christmas tree is shining in full glory. So pretty. It makes us realize how quickly Christmas will be upon us. We're not sure where we'll be by that time. We know we'll be in the company of good people. 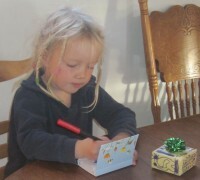 As it has worked out so far, so will Christmas 2009. 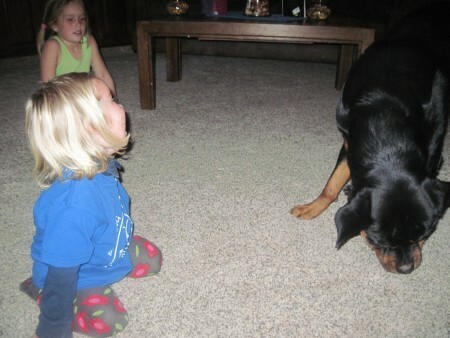 The girls play with Derek the dog. He's huge but oh so sweet. And funny too. He bounces a balloon off his nose and chases the light of the camera. Robin rolls all over him and he's fine with it. The girls are laughing as Derek hops after the flash of the camera. 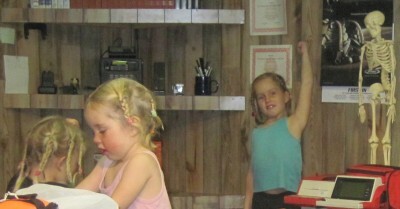 Daughter Jamee shows the girls a couple of cheerleading dances as well as rolls and cartwheels. Cheyenne has been practising on her cartwheels and can do them quite well already. Now she's working on her handstand. Once she stands on her hands and walks four steps. Wow. When Jamee is worn out, we play the family circus. This means that the girls take turns standing on Amarins' shoulders. Jasmine can now get off by just jumping to the front. Robin can stand, but needs some help getting off. We're having a great ground time. As the girls go to sleep we settle down in the living room for the movie "The Sea Gypsy". It's about a family being ship wrecked and landing in Alaska. Beautiful scenery. If all this isn't enjoyable enough, we enjoyed a steak and vegetables and home made rolls supper. Yummy. We wake up around five. It's too early for us to really get up, but not for Ron. He's fixing to get ready for work. And he's whipping up a breakfast too. When we finally do get up, it is ready for us. Thanks Ron! We enjoy our breakfast with Judy and daughters Jamee and Andrea. It's Andrea's birthday today. Hip hip hurray! When it's warmed up a hair it is time to head back to the car shop. We load up and are on the road once more. Thank you Ashbaugh family for your hospitality! We're barely out of town or Amarins calls for a break. A beautiful sight on the horizon to the southwest of us. Mountains! The Rocky Mountains! They're hardly noticable, but they're there for sure. Yihaa. That's worth a party! We'll take a rain check for it though. 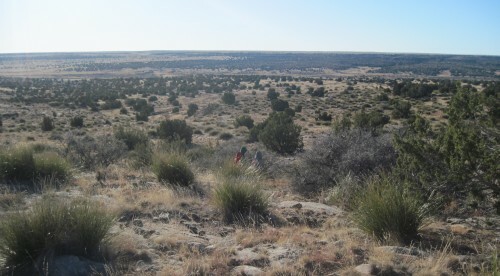 Our first New Mexico butte is in sight. The mountains are to hazy to catch with the camera. We're making great time. We don't understand why. It seems we're going up the hill, or mountains, yet it doesn't make sense when we look at the mile markers. This is the weirdest illusion ever. We think we're strong, that that is the reason we're going so fast. A break here, a break there. Just a little snack, nothing spectacular. And on we go. 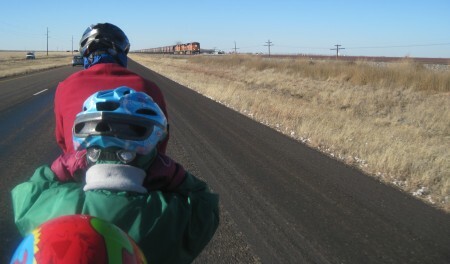 We are in De Baca county, ride through ghost town Tolar and arrive in Taiban. Another ghost town. 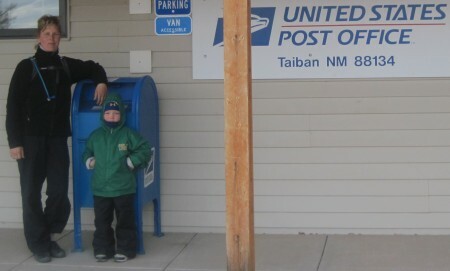 It does have a post office though. And it is still open because we arrived before noon. The post master lady lets us eat our lunch inside. Nice out of the wind. Jasmine just mailed a letter to Pake en Beppe. It's still early when we finish our lunch. 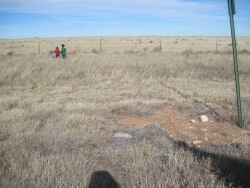 Fort Sumner is roughly 15 miles away. We've got all afternoon to travel the distance. We can either stay in a church or in a home. It is great knowing we have a place lined up again. Arrival in Fort Sumner. It certainly doesn't feel like we've been going down hill much today. We arrive in the middle of the afternoon. 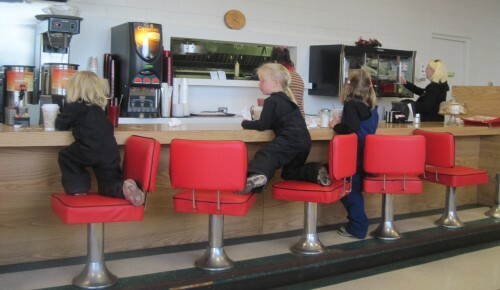 There are no restaurants or sit down places open, so we hunker down inside a filling station. We choose to stay at the home of Missy and Gary, to the delight of the girls of course. Tonight will be pizza and a movie in good company. The right choice we think. Missy is still at work, so we hang out a while. 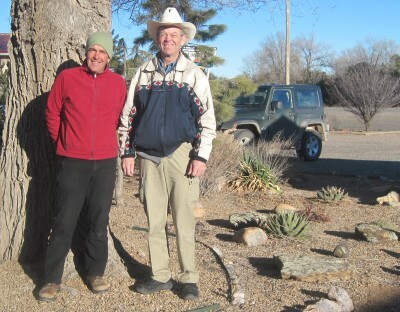 A friend arrives and takes us to the little adobe church around the block. The kids can run and play here, while eating their way through a chocolate advent tree. When Missy is off work she takes us to see the Bosque Redondo Memorial. It's dedicated to the history that took place during the 1860s. This area was set aside as an Indian camp. The army herded all the natives from the 4 corners area and the Carrizo mountain area. After 8 years they realized it was not working, several thousands of natives died, before the remainder where released to go back to their native grounds. Exploring the Bosque Redondo memorial. 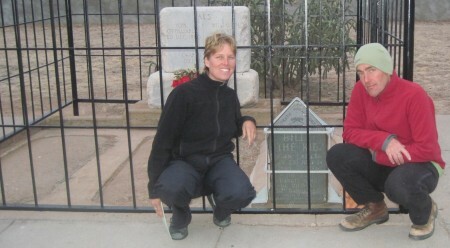 Alleged burial place of Billy the Kid and two of his cronies. If this is where he died and is burried, then who is the old man who died on the streets in Hico Texas? The legend continues. Before we arrive at Missy and Gary's home we have a view of the dam at Fort Sumner lake and the Pecos river, as darkness allows. Bill is in the back of the car. Somewhat cramped. This results in cramped legs. From time to time we have to pull over so he can stretch and work out the cramps. Missy makes sure to tell Gary to bring some bananas back home. A hot shower, a lot of water (to drink), some bananas. 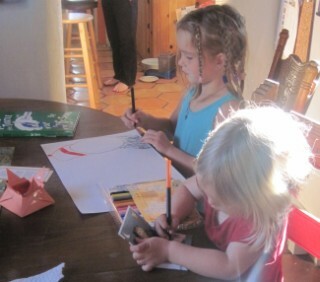 The girls playing, the grown ups talking. As good as home made pizza is in the oven. Robin is holding the rat in its ball cage. Cheyenne is wrangling snakes. 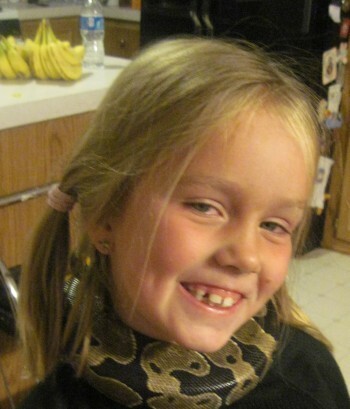 Cheyenne's new hobby: snake wrangling. The kids are in bed. We're on the couch watching the new Star Trek movie. Great and very relaxing. Weather: Blue sky, sly wind. In the morning we head into town as soon as we can get nine people ready. Not so soon thus. We have breakfast at the Rodeo Grill. It gives the weather a chance to warm up a bit more. Which is fine with us. Saying goodbye to the Smith family. Thanks guys! We are warned of the seven mile hill we'll be climbing once we get out of town. Yesterday we dropped over 500 feet to Fort Sumner. Today we'll be climbing that much and then some. Most of it in these first miles. Gary offers to bring the trailer to the top of the hill, but we decline. We'll safe that 'lifeline' when we get to the other side of the interstate. 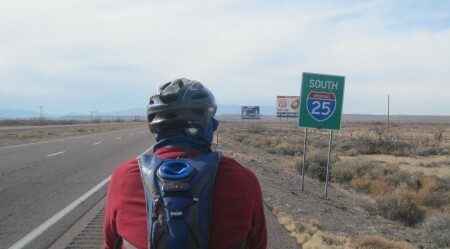 Amarins' brother is going to ride with us from Socorro into Arizona, if all goes as planned. He'll be our follow car and we'll use it to the hilt. For now we keep doing it on our own. Crossing the Pecos river near Fort Sumner. We go up. Stop. Look back. And continue. Pedal, piddle, pedal, piddle. The view back is magnificent. 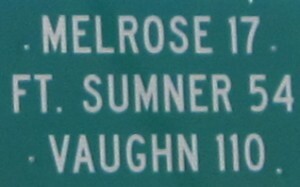 Fort Sumner is located in a big valley. And we climb higher and higher. It helps that our legs are fresh. Bills cramps seem to have worked them selves out. Great. 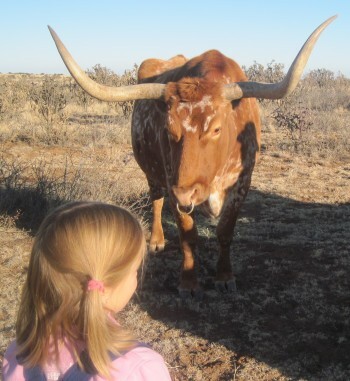 Close encounter with a long horn. It takes us almost two hours to cover ten miles. Not bad. Actually very good. The weather is to our benefit. The wind is barely noticeable. What a difference that makes. With ten miles covered, we're almost halfway for today. We are on our way to Yeso. There we'll connect with Jon. He is going to take us to his ranch, 12 miles north of Yeso, over a dirt road. Needless to say, we're going to ride there by car. Three little girls in the field. We have a nice picnic in the grass. Mountains are off in the distance. We can see at least 40 miles we think. Incredible. We're enjoying the rugged New Mexico country side. We arrive in Yeso just after the noon hour. Jon is already waiting for us with his trailer. We're loading up and head out. The girls are so excited. 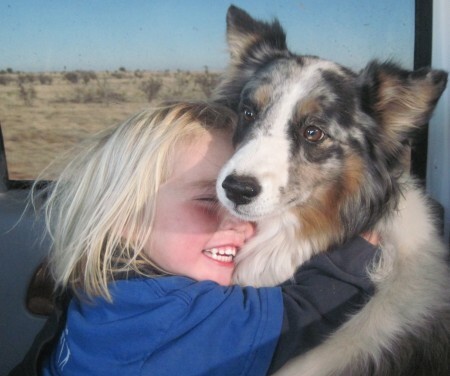 They know there are horses on the ranch and they're going to ride them. Every girls dream! Robin instantly falls in love with Lucy. It takes us a while to get to the ranch. The country we ride through changes by the mile. Then we enter the Salado Canyon. Yet again a different sight. More vegetation. 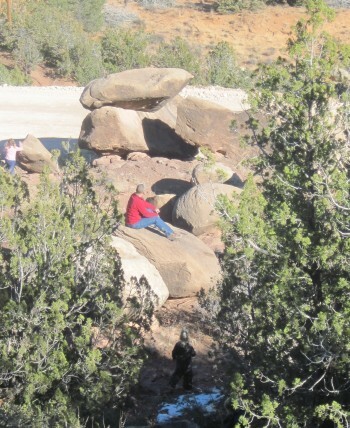 Side canyons, boulders. All shades of red. We're looking and looking. We could not have guessed that it would look so different here. This is something that goes by unnoticed from the road. Head into the country. Take a "wrong" turn sometimes and explore. Stunning views will appear. 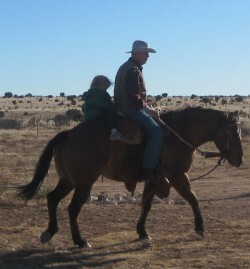 Jon and Suzanne are working on the ranch to make it available to guests. The first cabin is up and is almost finished. We get to stay in a travel camper, located on the edge of the canyon. What a sight. The cabin we'll use as playroom for now. When we're settled in a bit we head for Jon's bunkhouse. He's got rocks to bring over to build a fire pit. We're going to have a campfire tonight. While we're at the bunkhouse, the horses stop by, as does steer George. The fire pit is build in no time. Firewood is ready to go. A fire is up and going in minutes. It gives it so much more athmosphere. The girls know very well how to handle a fire, though they do get carried away sometimes with the amount of wood to throw on it. More more is the trend. With the fire going it is time to think supper. Jon has done some shopping and has filled the refridgerator well. Tonight we'll have pork chops and vegetables with apple sauce. Weather: Very relaxing, beautiful, windy in evening. 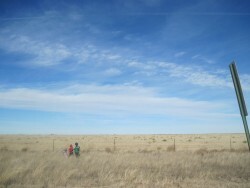 We are in the New Mexico country side. Pictures barely do justice to the beauty surrounding us. The camper we're staying in is located on the top of the ridge, overseeing the Salado Canyon. Billy the Kid once outran the outlaws in this canyon. We can see why. 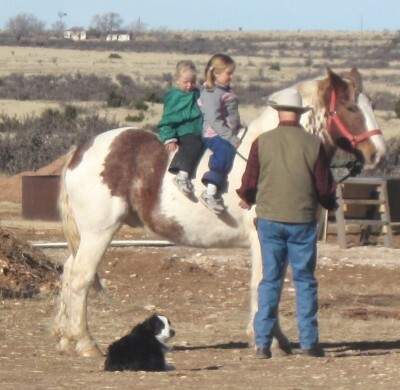 The girls get to ride horses, play with the dogs and roam the area. 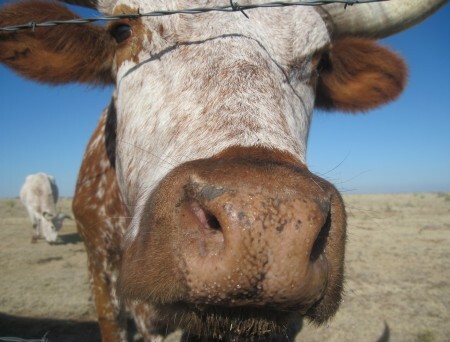 The ranch is working towards being in full 'production' by the spring of 2010. When the new cabins are installed, this will be the place to take your family. A weekend getaway or a total summer vacation. The outdoors is ready for you. 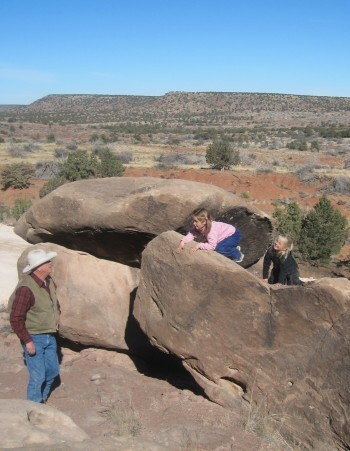 Climbing the rocks in Guadelupe county. There is still snow on the north slope between the rocks. 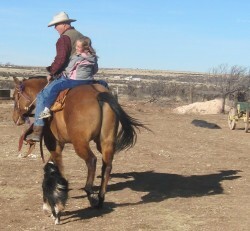 Jasmine and Cheyenne have a ride with Jon on Smokey Joe. We decide we can use another day relaxing in the Salado Canyon. Another day in pictures. The girls go exploring in the canyon. Amarins and Robin on Drew. We're hidden in the tall grass. 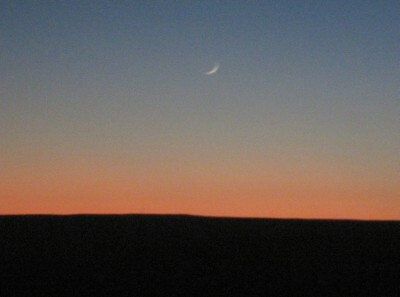 A crescent moon is visible on the sunset horizon. Weather: Hazy blue with a tiny tad of a tailwind. We look into the canyon once more before loading up. It is time to move on. Jasmine was feeling bad yesterday. She'd like to see home again. It caused quite a stir. All the automatic questions came up. Are we doing the right thing. Do we spend enough quality time together. How about one on one? Should we stop or should we go? Food to think over. We've found a place to stay in Vaughn. A church if it has shower facilities, other wise a motel. This might give us the time to be together. Just us again. We've had quite many different connections over the past week. Perhaps she's just in overload and needs some time to relax. It is not easy to be among new friends on a continuous basis. Not even for us. One more look over our shoulders as we climb out of the canyon. Yeso is ahead of us. From there we pick up highway 60 again to head for Vaughn. We timed it well and have a tiny bit of a tailwind. Plain luck you could say. Anyway, it is to our benefit and we take it gladly. From Yeso we can see a mesa in the distance. That is one to focus on. 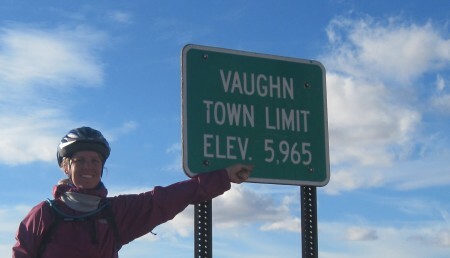 We are not quite sure where it is located in relation to Vaughn. It is hard to tell distances. Except for when we use the milemarkers of course. 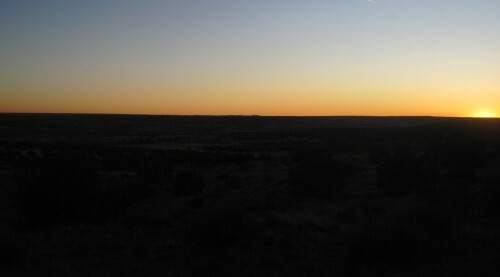 To the left of the mesas, very far in the distance we can see the Rockies. Only with a super zoom can it be seen in this picture. Do we hear it right? Jasmine is still singing and humming. Those are happy sounds that certainly sound wonderful in our ears. We've just got to keep taking it a day at a time. Although the winter signs are beautiful, warmer weather would be a wonderful thing. 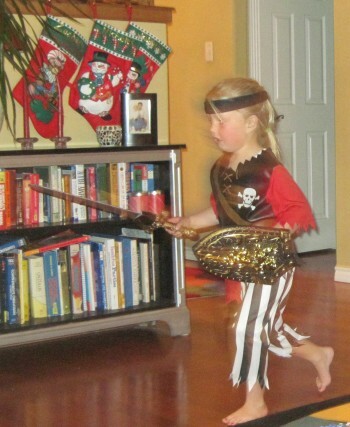 Just alone for the dressing up part already. It's just the road and us. The wind is behind us. One thing we don't have to fight today. We are climbing and climbing. It is a nice pattern that allows us a good rhythm. We go up and up, crest and go down a little. Then we go up and up again. We're actually gently rolling higher and higher. The portions that we go down are welcome breaks to rest our legs while still covering ground. Nice. 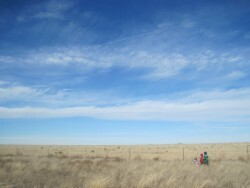 We are along side the mesa when we can see Vaughn very far in the distance. Still a 20 mile or so to go. We can see many inclines between where we are now and where we want to go. One at a time. One at a time. That's the only way. We are so thankful for the wind today. It's an incredible help. Mile after mile we get closer. It's two and we are within six miles. Oh yes we'll make it. 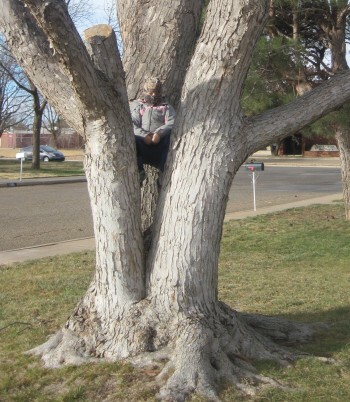 We called Peggy, an EMS friend of Missy from Fort Sumner. She has arranged a motel for us, since the church does not have showers. And we're ready for one. 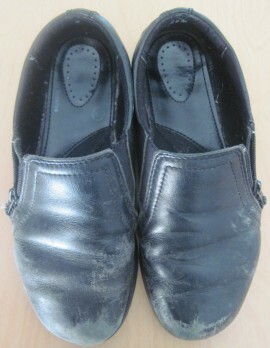 Just cowboy wash ups don't do anymore. Although it is nice that we can see town from such a long distance, it is also frustrating. We think we're almost there, but we're not. Until finally we do make it to the last hill before town and can distinguish the buildings and see a filling station and what looks like a restaurant. We're over a mile high! Higher then Denver Colorado. Drive a mile, imagine it vertically, that's where we are. Yep. Another over pass to cross the railroad tracks and we're in town. Penny's Diner looks very appealing. It has that old movies look. All silver on the outside. Warm on the inside. After a 1,200 foot climb and a 35 mile day we finally sit down, quite amazed by today's accomplishment. Jasmine seems to be doing better too. Of course the thought of warm food helps her here too. 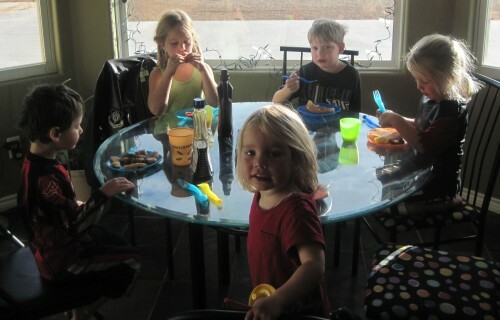 We finish supper by four. It is time to head for the motel, the sun is setting. Penny's Diner has picked up our ticket. Thanks manager! Sorry we didn't catch your name. Oh it feels cold when we get back on the bike. We're still sweaty and the wind is going through everything. On the pedals. Let's find the Desert Motel. It's still another mile. A long town that's for sure. Lot's of motels in this cross roads town. We're getting to the end of it when we see it. The manager gives us a three bed room. Robin will finally have her own bed. Very nice. We bath and watch cartoons and warm up at the furnace. Wonderful to be warm and squeaky clean again. 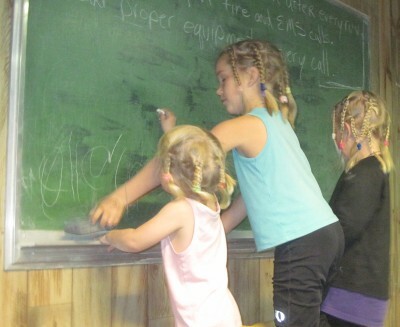 The girls even sit down long enough for Amarins to braid their hair again. Robin too. That's a first. Weather: Chilling with a head wind. With plenty of space for everyone we sleep wonderfully. We're going half the distance of yesterday, so we sleep in and watch some more cartoons. Bill walks to Allsups for some breakfast items and to stock up on some supplies for the next days. Encino has a little convenience store that may or may not be open. Next town Willard is 37 miles form there. It has a restaurant, but nothing else as we're told. Time to fill the panniers with extra's. It is after nine when we get somewhat ready to go. Bill checks some email at the motel office. We can't connect somehow. Strange. It's a good thing we've got our Facebook thing on our homepage so we can send a blur from time to time. Otherwise it would have seemed as if we had dissappeared into nowhere. Which to a certain degree is actually true. It does have its beauty though. We get to meet and thank Peggy before we leave. Not just has she helped us with this motel, she's also called ahead to the Encino fire department and arranged for us to stay there tonight. It sure is all working out alright. One place after another. And it's only about 17 miles to Encino. It is very chilly this morning, so a later start gives us a couple of extra degrees. The wind has turned towards the west again. We chug and chug and realize it is better to go uphill with a tailwind then downhill with a headwind. What a difference the wind makes. On top of that it also feels colder when the wind is in our faces. There are mountains between the mesas. 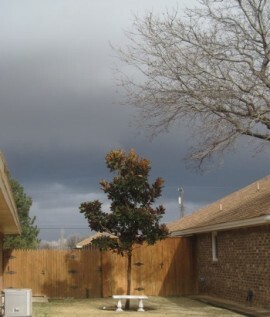 This is looking to the northwest this time. Mountains are all around us now. This time we can zoom and actually catch them on camera. Hah. After seven miles we find a picnic table. Time for a break. Cheyenne and Jasmine get off with Amarins. Bill stays with the bicycle so Robin can continue her nap. We don't break long, but long enough to have a piece of coffee cake. One of the treats Bill got a hold of this morning. It tastes good too. Then it's on and going again. We've climbed a bit to this point, but it seems to go more downhill from here. That's fine with us. We're ready to get there. Today is much harder then yesterday. Perhaps because we had such a good day yesterday. Who knows. We have to remember too that we're at around 6,000 feet in altitude. That's not nothing. We can see mountains in the distance wherever we look. We don't know their exact names, but we do know they are part of the Rocky Mountain chain. And we have the opportunity to pedal around these giants. How fortunate and blessed we are. We just don't seem to realize it often enough. What a journey it is, what an experiences already. As much as we do the physical work, we couldn't have made it this far without the support of folks like you. Thank you. We can see Encino clearly from the railroad bridge. According to our calculations it is another five miles to town. But we're off. It is less. Well, no problems with that at all. All we need to do now is find the fire station. And there it is. The door is unlocked and ready for us to get in. We can even park our bicycle next to the trucks. Super. We head for the break room and install ourselves there for the rest of the day. As we arrived into town we found the town park. As Amarins catches up on some website preparations, Bill heads for the park with the girls. It never really warmed up today so the outdoor playing doesn't take long. Still enough to have some fun. Inside the fire station the girls find other things to do. Cheyenne is showing her attentive class the workings of the shoulder. Time for the chalk board. We have lots of things to eat and munch throughout the afternoon. Bill checks on the little store from time to time and finally catches it open. Some new snacks for on the road tomorrow are added to our collection. The long afternoon proves to be a good time to catch up on some phone calls. One of them is to Jim from Albuquerque. He's going to help us out tomorrow if we don't make it to Willard. He has a contact near Willard that will come and get us if we don't make it. Great! Thanks Jim. Quality time together. With playing cards and setting up a tiny treasure hunt. Each of the girls has build a little house from tables and chairs to sleep in tonight. As they settle down in their homes, we hear a knock on the door. It's the mayor and his wife. They are inviting us for a hot breakfast tomorrow morning. At 8:20 this sunny morning we prepare to leave the fire station. In a balmy 25 degrees we head to the mayor's house. There we have breakfast buritos and juice in the company of Mayor Gordo and wife Martha. The kids watch a movie while we wait for the temperature to rise a bit more. It is almost 10 when we leave the town of Encino and move up the slight incline. The wind is ferocious. The head wind is over 20 miles per hour and it takes us about 40 minutes to creep in our lowest gear three miles. We realize this is madness. Willard is still over 35 miles away. At this rate we'll make it by noon tomorrow or so. A decision is made. It's time to turn back. The wind is to strong for us. We decide to head back to the warm and comfortable home of the mayor. We turn around and head back to Encino. The tail wind propels us like a bullet towards town. A train is along side of us. It is barely going 5 mph faster then we are. In less then 5 minutes we are back at the mayor's house. We are once again welcomed with opened arms. As fast as the train. A snow storm forecasted in a couple of days. Today we won't make it to Willard by bike. It is time to arrange for transportation to Mountainair. 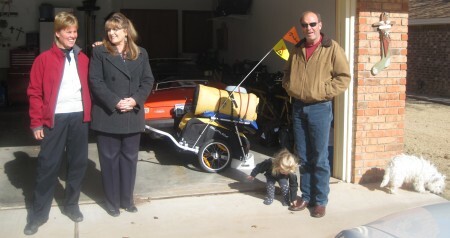 Gordo borrows a trailer and Ford Bronco. Bill and Gordo put the bicycle secure on the trailer and our gear in the Bronco. The girls and Amarins stay warm inside. 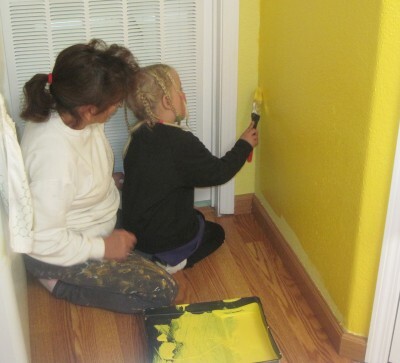 Jasmine helps Martha paint in the kitcen. 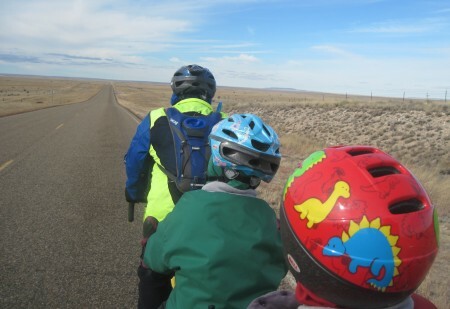 We are very sad as we travel by vehicle rather than bike. As we travel the Rockies really come into focus before our eyes. Our stomachs churn. After climbing 6200 feet from the ocean we are saddened we cannot enjoy this beautiful view at our normal pace. And at our own account. We are forced to give into the elements. This is probably the hardest thing we've had to do on our journey so far. We arrive at the salt flats. What a sight. Totally out of the blue they appear on our right. The native people have always mined slat here. It is so hard, standing here and looking at all this beauty, knowing that we had to be transported here. So hard. 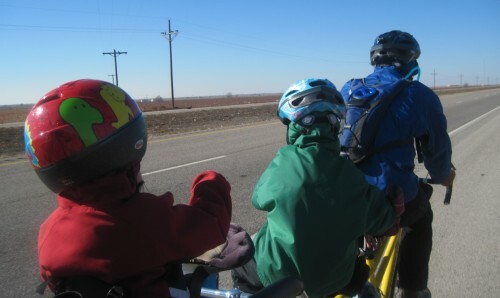 Moving at 60 mph, the ability to enjoy the view is far different than at our biking rate of 5-13 mph. It doesn't take away from the impressiveness of the mountainous terrain. The beauty is immense. By the time we settle into the Turner Inn we're slowly coming to grips with our decision to get to Mountainair via a trailer and truck. We realize that this situation could occure. It does not make it any easier for us to stomach though. We settle into our room and get ready for supper. We're having supper with the family we would've stayed with in Willard, if we'd made it there today. As evening falls, we slowly give into our bodies and cold symptoms take over. This is a perfect time to rest and ride out the weather and let our tired bodies recouperate. 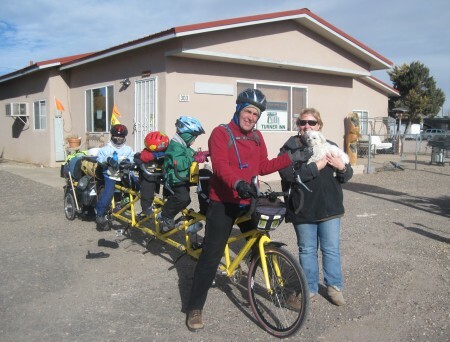 Ruth and Kevin, owners of the Turner Inn, are letting us keep the bicycle at the Inn. 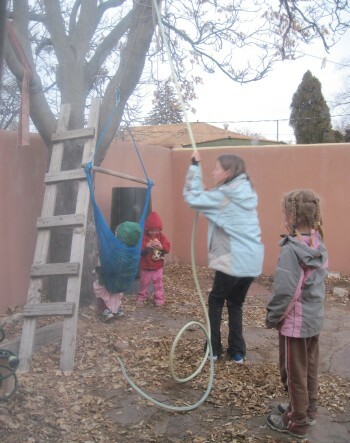 We are heading for Santa Fe tomorrow to celebrate the Christmas season. Fletcher is coming to pick us up today. 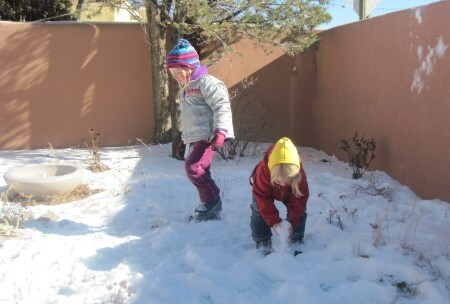 We're going to Santa Fe for this Christmas week. On our way to Santa Fe. Enjoying the tree swing in the back yard. Snow is so much fun to play with. Amarins and Jasmine snug out to the Santa Fe ski basin. A marvelous choice. We enjoyed the afternoon sledding. We are going back to Mountainair to continue our journey towards Alaska. More snow is expected during the week. 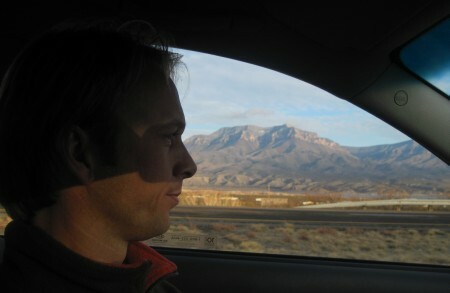 Tomorrow we are working our way down the mountain into the Rio Grande valley. Jim from Albuquerque is taking us back to Mountainair. He's also brought a tracking device. It is a device to track us any moment of the day. Click here to find out where we are right now. Jim picked us up from Santa Fe and brought us back to Mountainair. For supper we join Kevin and Ruth for delicious enchilladas. Time to pack up and load everything on the bicycle. It's been a week when we packed up and headed out of Encino. Today we are going to the Rio Grande valley. We are looking for warmer weather and hope to find it in the valley. The morning of our departure from the Turner Inn in Mountainair. We've had a great stay. Thanks Kevin and Ruth! We leave a little after ten. It is very very cold. We know that help is on the way. Kevin Bobb is on his way to meet us near Abo. We've been in touch since the beginning of our journey. 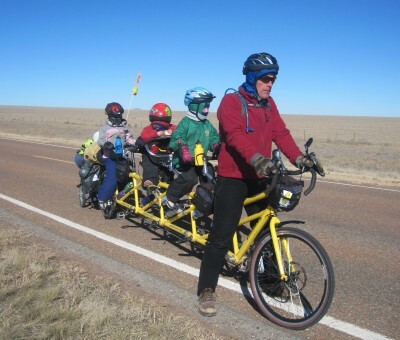 More members of his bicycle club are on their way to meet us on their bicycles. They are starting in Bernardo and are heading our way. Kevin arrives a couple of miles before we reach the Sallinas Missions in Abo. The temperature has barely increased. It is truly very cold. We make it the couple of miles to Abo and get in Kevin's car. The missions are almost a mile off the road. Not an extra mile we want to do by bicycle, but certainly a historical site we don't want to miss. The buildings at Abo were build with adobe in the early 1600s. This building is the remainder of the church. When we are back at the bicycle we've made another decision. Kevin is going to ride in Amarins' place. The girls and Amarins will ride in the warm car. There is still a little bit of climbing before we will descend into the valley. Bill and Kevin travel through the snow covered mountains. We've got the music going. It is nice and warm. We slowly follow Bill and Kevin. This allows us to still enjoy the country side at our usual speed. The climb is not to steep, but quite a long one. Just after they make the final crest, we see the bicycle club members appear on the other side of the road. Bill with Kevin, Mark, Joe, Kay, Paul and Dave of the bicycle club. They meet us just before we get to cruise into the valley. Kevin travels 25 miles through the cold weather. 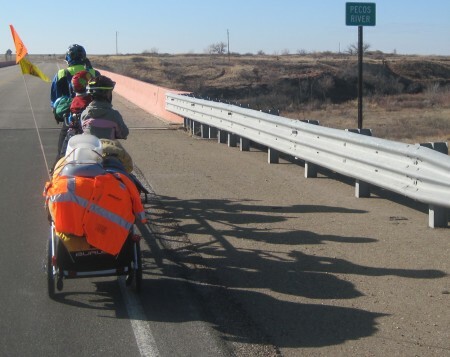 Just a couple of miles before the Rio Grande, it is Amarins' turn to finish the day. It is late afternoon as we arrive in Bernardo. 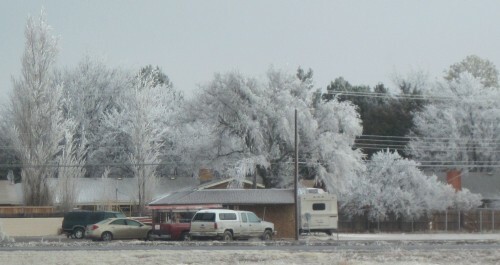 A town of three houses and an RV park. 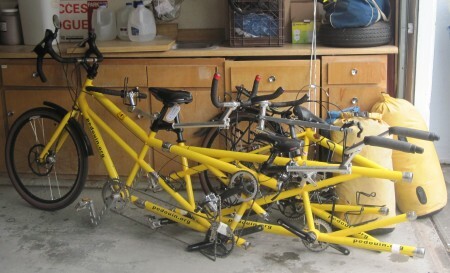 We've made arrangements for the bike to be parked at the RV park. 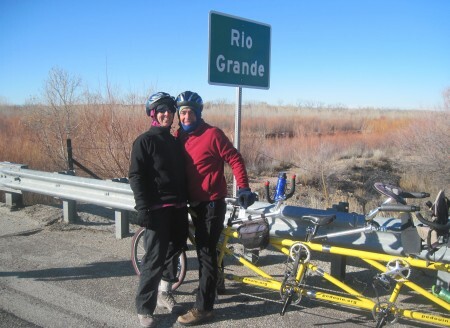 We are going to stay with Howard and Heidi on the Rio Grande. 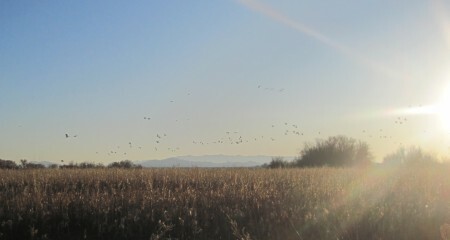 Before we arrive we take a tour through the wildlife reserve to see the cranes and snow geese settle in for the night. The birds are settling in for the night. Weather: Cold with a slight tailwind. What are we doing here! 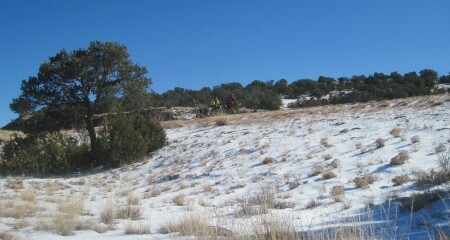 We definitely are to late in the season to cross New Mexico. While we were in Santa Fe we already changed our plans. We ar no longer taking highway 60 all the way across. We are going further south to Hatch and then head west. It's just too cold here. We're too dependend on the people we meet. And we like our independence, to be able to put up the tent and camp out. Howard and Heidi are great in extending their hospitality. 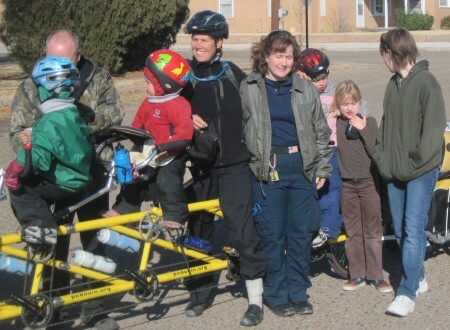 Bill and Amarins are going to bike to Socorro while the girls can stay and play. Most of our luggage we leave in Howard's car. This will help us make it to Socorro sooner. 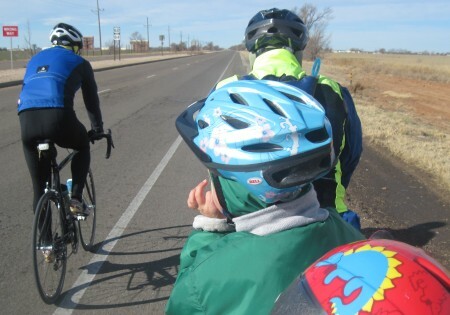 From Bernardo we first need to ride 12 miles on the shoulder of I-25. There is no other road that takes us south. We are riding the interstate. We have a slight tail wind. The weight of the bicycle and gear is minimal. We make good time. All of a sudden a car drives next to us and rides very slowly. Amarins recognizes the driver immediately. It's Wâtte, her brother! We decide to go a couple miles further to the rest area so we can sit and talk for a while. As well as warm up in his car. It's good to be together. Wâtte is following us a little while before heading for Socorro. He'll wait for us there. We've already made sleeping arrangements with a member of the local bicycle club. Wâtte can stay there too. We still have 15 miles to cover before we're in town. It's going swiftly and we get there by midafternoon. The mountains north of Socorro. As we wait for the girls to arrive, we have marvelous grown up time in town. The girls have had a great day playing games. Jasmine also got her sleeves sown back on her princess dress. Thanks Heidi. In the evening we meet several other members of the bicycle club. We all have pizza together. It's a good time. Weather: Warming up by the mile. We wake up to a two inch layer of snow. Just as the weatherman forecasted. Now what do we do. We love the winter, we enjoy the snow. But just not now that we are on our way by bicycle. We have to make some radical changes to our plans. Travelling by bicycle is out the window in this area. We've arrived here to late in the season. Yeah. Playing in the snow. Amarins takes the girls sledding with Catherine on the golf course. Bill and Wâtte are diving into the phone books to find a way of transportation. Whether it is renting a pick up truck or even a u-haul. We've come to the conclusion that it is time to transport our way to warmer weather. No luck with finding a simple pick up truck to use for transportation. U-haul has a 26-foot truck for rent. Ouch. What must be done must be done. Bill and Wâtte head for the rental place which thank goodness is in Socorro. When they get there they're told that the truck is actually already rented out. Bill throws his hands in the air to ask the universe what it has in store for us. Soon after that the phone rings. 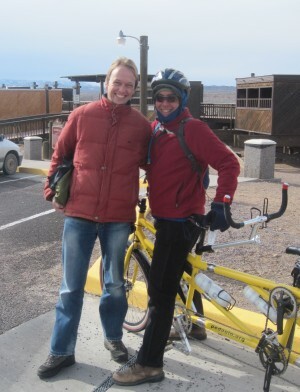 An Albuquerque bicycle couple is on it's way to Tucson. They would like to meet with us and see the bicycle. They are travelling in a pick up truck... 1 plus 1 equals transportation. Thank you universe! We play some games as we wait for Steve and Jennifer to arrive. We load everything in their truck. They will meet us tomorrow in Tucson. We are traveling with Wâtte. This way we can both go our own pace. Amazing how the universe has worked this out. It's already by two when we are on the interstate heading south. It is 36 degrees in Socorro. The roads are all clear from snow. It didn't really stick. 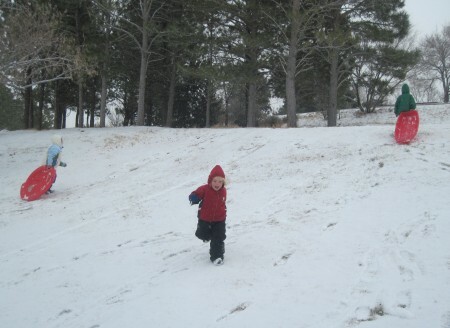 We're glad we took the opportunity to go sledding this morning. As we travel mile after mile we can see the little road that we would've pedalled our bicycle on. It looks like it would have been a pretty road. Gently rolling, along side several mountain chains. We're passing mile after mile of mountains. It is a 370 mile journey to Tucson, Arizona. By bicycle, under good conditions, it would've taken us at least two weeks. We do it in an afternoon and an evening by car. A stunning difference. We enjoy the ride. What we enjoy even more is the rising temperature. It is 39 degrees in Deming, 43 degrees in Lordsburg. We arrive in Tucson at a balmy 51 degrees. We've made the right choice. The sun is shining. The palm trees are gently waving in the slight breeze. We're in a more tropical area. That's for sure. On our way to the breakfast room we have to go outdoors for a little bit. Not a problem without coats, hats, mittens and skipants. 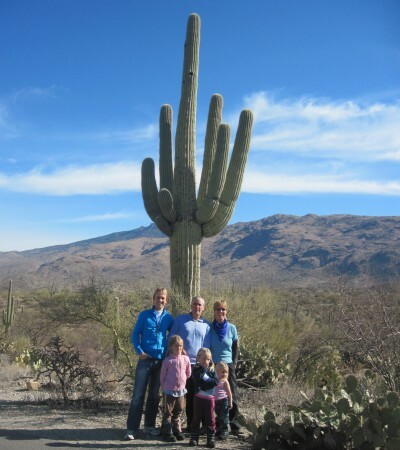 We visit Saguaro National Park with its abundance of cactus. The brochure says there are 50 different cacti here in the park. The tall saguaro being one of them. Of these there are hundreds. They obviously stick out above the others. Very pretty. At Saguaro national park, east of Tucson, Arizona. After roaming the desert it is time to find the bicycle and start putting it back together. Bill and Wâtte take care of that. Amarins and the girls go back to the motel. It doesn't take as long as anticipated to put the bicycle back together. 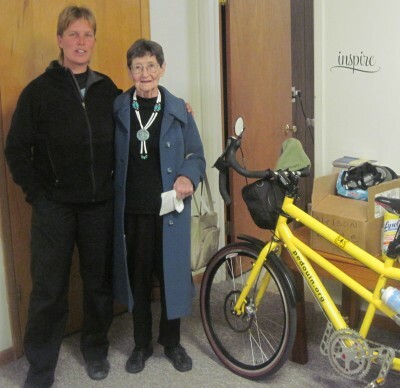 Wâtte gets the opportunity to ride the bicycle back to the motel with Bill. A new experience. Tomorrow our journey continues. Continue the journey in Arizona. Click here.